There’s a precious, antiquated notion of what the afternoon tea experience means: digging into tiers of tiny sandwiches and sipping from twee teacups. But these days, the options for tea in Seattle have expanded far beyond the British version proffered by the Queen Mary Tea Room in Ravenna, a spot that has long been the city’s pillar of the traditional tea. From an updated take on that seated afternoon tea experience to Asian-imported novelty tea drinks served with petite pastries, the area’s new tea scene includes strikingly designed shops, wide selections of tea and globally inspired experiences. Here’s where to get your next cuppa, and for the establishments with limited hours, when to show up. While its name includes “green tea,” this incredibly popular Japanese-chain café, which opened in November in the Denny Triangle, specializes in matcha—ground green tea leaves from which the stems and veins have been removed—made with leaves from Nana’s own tea plantations. The process of making matcha results in a tea that is stronger and more concentrated than you may have experienced with a brew-at-home green tea bag. Most of the drinks at Nana’s include milk and sugar, such as lattes with brown sugar syrup, or are topped with swirls of soft-serve ice cream. And while tea is the focal point of this café, Nana’s really excels in its food offerings, such as the selection of matcha pastries (cake rolls, cream cheese pound cake, white chocolate cookies) behind glass at the counter, where you also can order savory Japanese comfort food to be delivered to your table. Our pick: For something savory, try the chicken karaage curry: crispy-crusted, tender bites of fried chicken atop a beguiling pool of mild Japanese curry (and served with miso soup and white rice; $12). 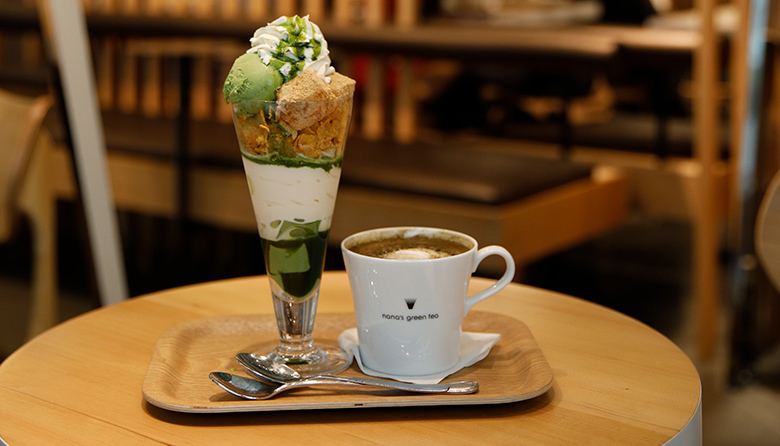 For dessert, get the matcha warabi mochi parfait, which features matcha pudding, red bean paste, matcha ice cream, jelly-like warabi mochi and a crown of crunchy cornflakes layered in a tall sundae glass ($9.75). Wash it all down with a hojicha latte, made from roasted matcha ($4.75). The ordinary appearance of this 12th Avenue storefront on Capitol Hill belies the stunning interior and impressive tea beverages offered within. Bold, leafy wallpaper and low modern tables adorned with fresh flowers invite diners into the bright shop to try cheese tea—a tea topping of whipped cream-cheese foam (a trend that originated in Taiwan’s night markets and is big in Asia). Opened at the end of 2018, the shop focuses on matcha drinks and bubble tea, but makes them from real tea—a welcome change from the powder used at many places. The ultrahip aesthetic smacks of Instagram bait, but the drinks here are about more than just good looks. Our pick: Forget your qualms and try the cheese tea. The savory, light topping of milk, cream cheese and whipping cream with a pinch each of sugar and salt is a good choice for capping a cup of gyokuro (“jade dew”) green tea ($5). Pair it with a miniature cherry crumble cake ($3.50) or any of the other tiny treats from Bellevue bakery Pastry Mitten. Like wine and coffee, tea is nuanced and comes in many varieties. It can be intimidating to figure out what type you prefer to drink. LizzyKate is a tea café designed to help you decide that. Its staff will happily walk you through the color-coded wall of tins containing white, green, black and other types of tea—all of which can be prepared hot, cold or as a tea latte. There’s also kombucha on tap and cold-brew tea. For food, the café offers assorted baked goods and a few fancy chocolates on a regular basis, but aim to catch one of its monthly pairing events, be it tea with cheese, Girl Scout Cookies or macarons. Our pick: On Fridays and Saturdays, from 3 to 8 p.m. (days subject to change), LizzyKate offers a themed tasting flight of four or five teas ($5). And on the second and fourth weekends, you can also preorder wagashi (Japanese sweets) from Phinney Ridge’s Tokara to go with your tasting (price varies). Though advertised as afternoon tea, the weekly Sunday event at this excellent bakery is more like a leisurely stroll through the most creative parts of owner Rachael Coyle’s repertoire. Once the pastry chef for the The Herbfarm, Coyle’s pastry case—while one of the best in town—doesn’t give her the space to fully demonstrate her chops, so the afternoon teas give her the chance to expand her offerings. If you can snag a table reservation for this tea ($52, gratuity included), you’re in for a show: A selection of seasonally changing dishes could include savory buckwheat galettes, cucumber and radish salad, baked eggs, currant scones with gooseberry jam, or summer Pavlova with marionberry sorbet. Each of the three courses (savory, pastry and dessert) is paired with a different tea. Our pick: The tea-and-food pairings for the afternoon tea are predetermined—look for Nahorhabi Assam with savory courses, red diamond rooibos with sweets, and a bai hao oolong with desserts—and everything is included in the cost of this meal. That said, we strongly recommend indulging in the supplemental glass of sparkling wine ($10).